Saw this caricaturist photo on Facebook. 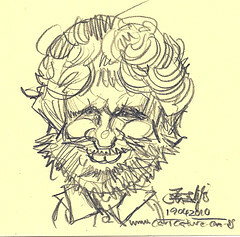 Hand itchy, and started scribbled on my 7.5cmx7.5cm Post-it pad. If time allows, I will do a better and larger digital caricature of him.